Pool Party Ideas for Easter! Easter Pool Party – Food, Decorations and Games! The first day of spring just happened and now Easter is right around the corner! In Florida, we are keeping warm as our neighbors to the northeast as experiencing some serious snow days. In light of the holiday and even as we experience a bit of a comforting chill for us Floridians, we think it is the perfect time to enjoy your backyard and host your guests outdoors. For those families with kids, we love a good easter egg hunt! If weather permits, why not take this hunt to the pool? Fill a pool with plastic Easter eggs and have children scoop them out of the pool, as opposed to the traditional egg hunt around the yard. To make sure that this is appropriate for all swimming abilities, place eggs in various parts of the pool with some in the shallow end and some in the deeper end. Don’t forget the parent supervision on this one. 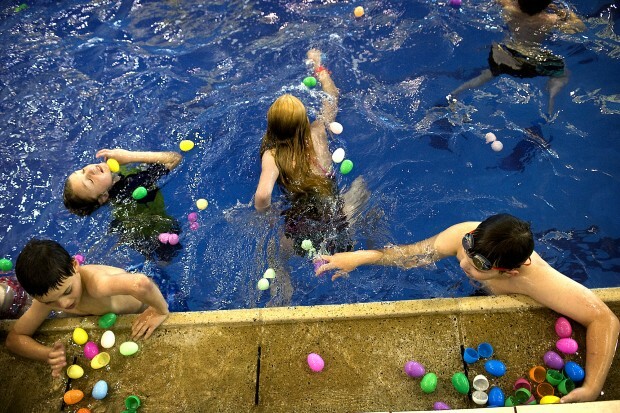 For those more advanced swimmers and children that are a bit older, an underwater egg hunt is always fun. Place weights in the eggs and they will sink to the bottom as the kids have to swim down to see who collects the most! Wanting to stay dry this Easter? That is okay, there are plenty of options for those adults (and kids) to enjoy. Have a brunch accompanied by your own mimosa or bloody mary bar. For the kids, dying Easter eggs in your own custom coloring station is a must. For an bit of extra furry fun, have a small petting zoo accompanied with your own bunnies and chicks for both the kids and adults to enjoy. Also great for photo opportunities. Most importantly, enjoy this time and holiday surrounded with your loved ones. Happy Easter from our family to yours! Swimming Pool Easter Egg Hunt.